Summary: We herein report a case of a ruptured superior hypophyseal aneurysm of the left supraclinoid carotid artery that could not be treated with a Guglielmi detachable coil (GDC), even in combination with a supporting nondetachable balloon. After an unsuccessful attempt at surgical clipping, treatment consisted of the placement of a stent over the neck of the aneurysm, advancement of a microcatheter through the stent mesh, and endosaccular embolization with a GDC. The late clinical outcome was excellent. Endosaccular coiling of cerebral aneurysms with electrically or mechanically detachable coils has become an efficient and less invasive therapy for inoperable as well as for operable cerebral aneurysms (1–5). The major technical drawback of the method is migration of coils from wide-neck aneurysms. Recently, techniques with supporting nondetachable balloons were introduced, dramatically improving results of endovascular coiling techniques in wide-neck aneurysms (6). We herein report a case of a ruptured superior hypophyseal aneurysm of the left supraclinoid carotid artery that could not be treated by GDC, even in combination with a supporting nondetachable balloon. After an unsuccessful attempt at surgical clipping, treatment consisted of combined endovascular stent and endosaccular coil placement. A 50-year-old woman suffered a “worst-ever headache” during the night and was referred to our hospital. A clinical examination showed meningeal signs and slight confusion (Hunt and Hess grade II). Unenhanced CT confirmed subarachnoid hemorrhage without specific distribution. The patient received nimodipine (Nimotop-R, 10 mL/h) intravenously. Four-vessel cerebral angiography revealed a small (3-mm) aneurysm of the supraclinoid segment of the left carotid syphon of the superior hypophyseal subtype (Fig 1A). The aneurysmal neck appeared smaller than the dome. Therefore, we decided after multidisciplinary discussion between the neurosurgeon (F.V.C.) and the neuroradiologist (G.W.) and after obtaining full and informed consent from the patient and her husband, to attempt coiling of the lesion. Intravenously administered heparin was started to double the activated clotting time to 240 seconds. After placing a 6F introducer sheath (Cordis, Miami Lakes, FL) in the right groin and performing selective catheterization of the left internal carotid artery with a 6F guiding catheter (Envoy; Cordis), we performed superselective catheterization of the aneurysmal lumen by using a double-tip microcatheter (Excell-14; Target Therapeutics-Boston Scientific, Fremont, CA). Attempts to introduce 3/8/10 and 3/6/10 GDCs (Target Therapeutics-Boston Scientific) were unsuccessful because the coils moved out of the aneurysm through an apparently wider neck than that which was angiographically visible. Therefore, after placing a second 6F introducer sheath in the left groin and introduction of a second 6F Envoy guiding catheter in the left internal carotid artery, we introduced a nondetachable occluding balloon (Magellan-Balt, Paris, France) over the neck of the aneurysm. We administered additional heparin to obtain an activated clotting time of 360 seconds. During balloon inflation to a diameter of 4 mm, we successfully introduced a 3/6/10 GDC into the lumen of the aneurysm (Fig 1B). After deflation of the balloon, however, the coil again moved out of the aneurysm into the supraclinoid portion of the internal carotid artery (Fig 1C). The neurosurgeon proposed operating to inspect the possibilities of clipping visually or at least to evaluate the chances of narrowing the neck of the aneurysm to allow coiling. During surgery, we confirmed the preoperative diagnosis of an aneurysm of the supraclinoid portion of the left internal carotid artery. The neck of the aneurysm was situated on the medial part of the carotid artery. The dome of the aneurysm bulged into the cavernous sinus. The distance of the aneurysm to the posterior communicating artery and anterior choroidal artery was approximately 5 mm. Important adhesions between aneurysm, carotid artery, and dura prevented safe clipping of the neck of the aneurysm, and we decided to abandon surgery. After a new multidisciplinary discussion, we decided to try to treat the lesion the next day with a combination of coils and a stent. Stressing the experimental nature of the treatment, we obtained informed consent from the patient and her husband. After the bilateral introduction of 6F sheaths and 6F introducer catheters in the left internal carotid artery, we initiated intravenous administration of heparin to an activated clotting time of 360 seconds. We advanced a double-tip microcatheter (Turbotracker 18; Target Therapeutics-Boston Scientific) via the right side in the aneurysm. 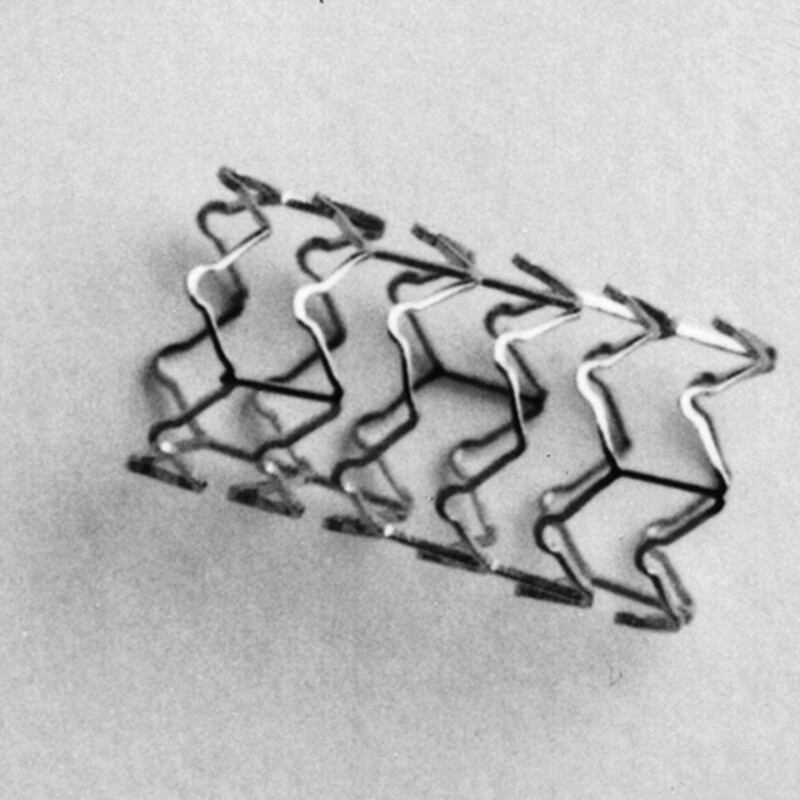 An 8-mm-long flexible balloon-expandable coronary stent (ACS Multilink RX Duet; Guidant Vascular Intervention Group, Santa Clara, CA) was positioned in the supraclinoid portion of the left internal carotid artery over the neck of the aneurysm and between the origin of the posterior communicating and ophthalmic arteries (Fig 2A). Balloon inflation up to 9 atm assured a stent opening of 4 mm (Fig 2B). Attempts to introduce a coil through the microcatheter failed, probably because the stent compressed the catheter lumen. The catheter was withdrawn, and a smaller microcatheter (FasTracker 10, Target Therapeutics-Boston Scientific) was introduced. It was possible to introduce this microcatheter through a strut of the stent into the aneurysm. Two coils (CDC-SOFT 3/6/10 and 2/8/10) were sufficient to occlude the aneurysm totally (Fig 3A and 3B). Repeat angiography showed total exclusion of the aneurysm, with patency of the posterior communicating artery, the anterior choroidal artery, and the ophthalmic artery. Heparin was continued for 48 hours at 1000 IU/h. On day 3, therapy with platelet-aggregation inhibitor (ticlopidine [Ticlid-R], 250 mg twice daily) was started and continued for 1 month. Pseudoaneurysm formation and infection in the groin complicated the postoperative evolution, necessitating surgical intervention and long-term treatment with antibiotics. Repeated blood cultures taken after the patient stopped using antibiotics remained sterile. The neurologic outcome was excellent. The most difficult types of aneurysms to treat with GDCs, if the parent artery has to be preserved, are lesions with wide necks and fusiform or dissecting aneurysms (3, 4, 6–10). For wide-neck aneurysms, Moret et al (6) recently advised the use of a temporary supporting balloon to prevent coil herniation into the parent artery. Although this method has been widely used since then and was successful in our hands in many cases up to now, in this particular patient, the coiling during temporary balloon occlusion failed, with migration of the coil to the supraclinoid portion of the internal carotid artery. The use of stents in experimental saccular wide-neck aneurysm models has been well documented (11–13). Nevertheless, these stents, which were relatively stiff, were placed in experimental aneurysms created on comparatively straight common carotid arteries. Therefore, clinical application necessitates a specific design for negotiation through the small and tortuous intracranial vessels. Recently developed coronary stents seem to meet these requirements. To date, there are few reports on the use of stents for supporting GDC delivery. Stents have been used for treating wide-neck cerebral aneurysms of the petrous portion of the internal carotid artery (7), the V4 segment of the vertebral artery (8, 9), and the fusiform aneurysm of the basilar artery (10). The stent used in our case was the ACS Multilink RX Duet coronary stent. It is composed of a 316L stainless steel alloy with a low (.043-in) profile. The main advantage of this stent is its flexibility, allowing passage through tortuous vessels such as the coronary arteries or, as in our case, the carotid syphon. A disadvantage, in our experience, is the small size of the interstices (Fig 4), rendering passage of a Tracker-10 microcatheter difficult. Others have used the Palmaz-Schatz balloon expandable stent (10) (Johnson & Johnson, Warren, NJ) or a Microstent 2 over-the-wire coronary stent (Arterial Vascular Engineering, Santa Rosa, CA) (7, 8) to hold the coils in place. The major advantages of these stents are wide interstitial dimensions of the interstices between the struts of the stent, allowing easy passage of a microcatheter in the lumen of the aneurysm through the interstices. On the other hand, we doubt that it would be possible to navigate these stents across the carotid syphon. It is important to mention that appropriate medical therapy after stenting is necessary to prevent the formation of neointimal hyperplasia or early thrombosis (14–16). Because there is little experience with stents in the smaller intracranial arteries, it seems logical to rely on the results of antithrombotic drug regimens in similar smaller arteries, such as the coronary arteries. Recently, it has been shown that the combination of aspirin (325−500 mg/day) and ticlopidine (250 mg twice a day) resulted in a lower rate of stent thrombosis and a reduced bleeding rate than with a combination of aspirin and warfarin. Therefore, we advise the use of ticlopidine for 4 to 6 weeks after the stenting, with regular check up of white cell and platelet count. Aspirin can be continued for up to 6 months. The combination of stents and coils seems an attractive solution for the treatment of wide-neck cerebral aneurysms. Several technical problems, however, will need to be solved to allow its widespread use (8, 10). First, even more flexible stents will have to be engineered to allow superselective intracranial navigation. Our patient was relatively young with smooth, nonatheromatous, nontortuous vessels. In older or hypertensive patients, the distal positioning of the stent might be cumbersome. The diameter of the stents will have to be smaller to allow very distal deposition in vessels as small as 1 mm. Another problem concerns the preservation of perforating branches. Although stents do not interfere with the patency of crossing side branches in the peripheral vascular system, it is not known what will become of small perforators such as the transverse pontine branches of the basilar artery or cavernous branches of the circle of Willis. Finally, treatment of bifurcation aneurysms, such as basilar tip aneurysms or aneurysms of the bifurcation of the internal carotid artery into anterior middle cerebral arteries, will require specific bifurcation stents. Theoretically, another solution might be the use of covered stents to occlude the aneurysmal neck without the additional need for coiling. This possibility was experimentally studied using a vein-loaded stent (17). Problems of size and flexibility of the device, fenestration for perforator artery preservation, and prevention of thrombosis of the stented vessel will be even more important. ↵1 Address reprint requests to Guy Wilms, MD, Department of Radiology, UZ Gasthuisberg Herestraat 49, B 3000 Leuven, Belgium.